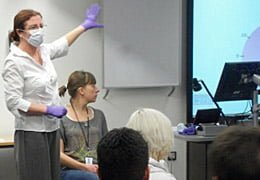 In the UK, we run regular training sessions based around the Teeth Relief Manual for nurses and doctors studying Diploma courses in Tropical Nursing and Tropical Medicine at the London School of Hygiene and Tropical Medicine (LSHTM). 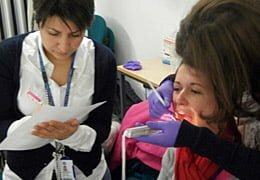 Most aid agencies now require their nurses to have completed the Diploma in Tropical Nursing before working in low resource countries so for us, having an Oral Health component within this course is a powerful way to stress its importance, give nurses the confidence to include the mouth in general healthcare and deal with emergencies if they arise. Dame Claire Bertschinger, course leader for the Diploma in Tropical Nursing at the London School of Hygiene and Tropical Medicine is personally committed to the importance of oral healthcare. Oral conditions, signs and symptoms.